Richard Harold Ross, 80, a retired Air Force colonel who was director of the Airlie Foundation conference center from 1969 to 1980, died of complications of diabetes May 24, 1999 at Culpeper Memorial Hospital. He lived in Warrenton. Colonel Ross was with Airlie, one of the first conference centers in the country, during the period when it expanded from small meeting facility to a major center used by government and industry. He was a native of Thief River Falls, Minnesota, who attended the University of Minnesota and was a graduate of George Washington University. He received a master's degree in business from George Washington and a doctorate in higher education administration from the Union Institute of Cincinnati. Colonel Ross served in the military from 1941 to 1968, when he retired from a Pentagon assignment. He was a pilot in the Army Air Forces in Europe during World War II. He served in Germany in the 1950s. He was an assistant dean of the business school at George Washington after retiring from the Air Force. After he left Airlie, he was dean of business at Marymount University in Arlington until 1995. His wife of 43 years, Olga Ross, died in 1987. Survivors include four children, Susan Tubbs of Berryville, Va., Carol Ross Joynt of Washington, David Ross of Bainbridge Island, Wash., and Robert Ross of Warrenton; and three grandchildren. 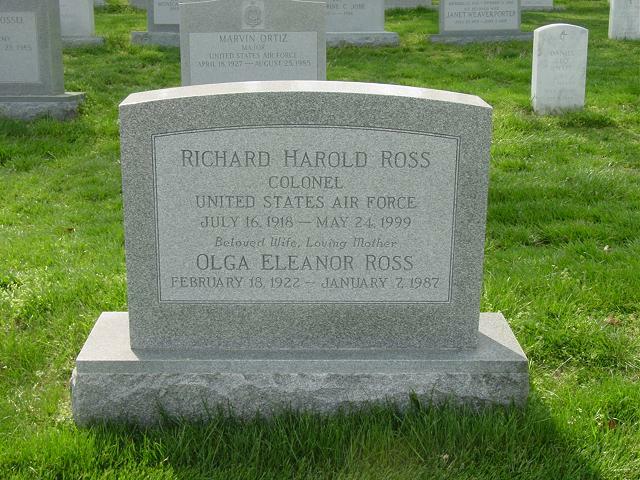 On Monday, May 24, 1999, RICHARD H. ROSS, of Warrenton, VA. Beloved husband of the late Olga Ross; father of Susan Tubbe, Carol Joynt, David and Robert Ross. He is also survived by two grandchildren, Spencer Ross Joynt and Emily Ross. Services will be held on Wednesday, June 9 at 9 a.m. at Fort Myer Chapel, Arlington National Cemetery. Interment Arlington National Cemetery.